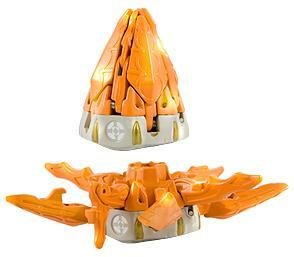 Spartablaster is a Bakugan Battle Gear. The cone on its back opens up revealing four deadly points with heat tracking sensors that shoot out and destroy the enemy. The cone spins like helicopter blades, lifting Spartablaster into the air for aerial battles. An activated heat beam glows energy and melts an opponent's shield. It is Contestir's Battle Gear. Purchase your Spartablaster Battle Gear from eBay now!